The South African government efforts to redevelop and grow the country’s maritime economic sector have been given yet another with boost with the formal registration of the first shipping vessel under the country’s flag. 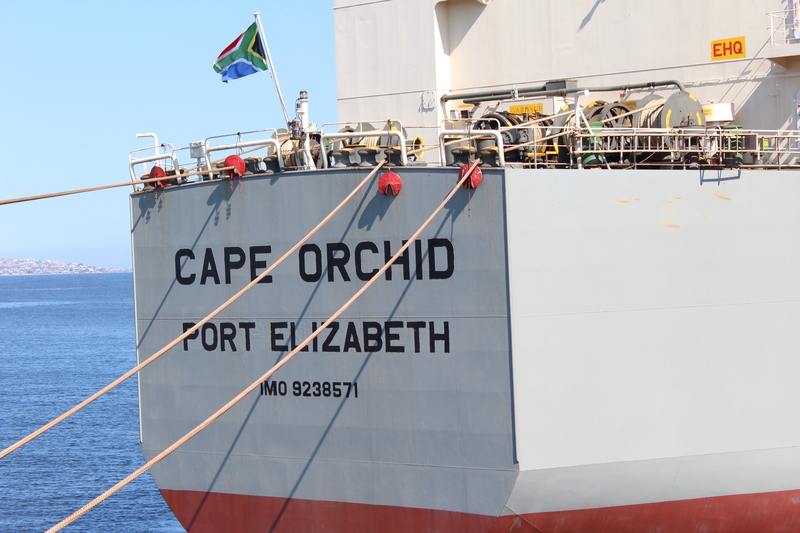 The historical event that took place in China earlier this month and celebrated in Saldanha Bay on Thursday afternoon last week, marked the first time any commercial shipping vessel has been formally registered to carry a South African flag since about three decades ago. The vessel named Cape Orchard is privately owned by Vuka Marine, a South African joint venture company between Via Maritime Holdings (South Africa) and Hong Kong based Japanese firm, K-Line. The registered vessel, named the Cape Orchard; was officially unveiled at a ceremony in Saldanha Bay on Thursday afternoon (September 24, 2015) and during which event, the first three South African cadets onboard a South Africa registered vessel were placed– also a historical first. Posted on September 28, 2015 September 28, 2015 by sfayoPosted in Breaking NewsTagged Andrew Millard, Cape Orchid, Department of Transport, Diipuo Peters, K-Line, Minister of Transport, SA flag, SA Maritime Safety Authority, Saldanha Bay, Ship registration, Via Maritime Holdings, Vuka Marine.